A two week expedition of West Bengal and the remote kingdom of Sikkim - home to fabulous scenery, amazing religious monuments and lively cultures - offering outstanding experiences which will live long in your memory. 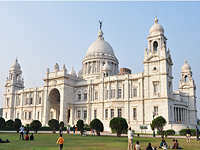 Upon your arrival at Kolkata airport, you will be met on arrival and transferred to your hotel for overnight stay. After breakfast, we take a sightseeing tour of the city accompanied by a local guide who will take you to all the famous monuments, temples and bazaars, including a visit to the imposing Victoria Memorial. Opened by the Prince of Wales in 1921, this vision in marble is often called the “Taj” of the British Raj. We also visit the New Market – a bazaar on Chowringhee Road, the stately Indian Museum founded in 1814 and the oldest and largest in India, St Paul’s Cathedral and the extraordinary Marble Palace which houses paintings by Rubens, Titian and Reynolds. In the evening transfer to railway station from where you board the Darjeeling Mail train to New Jalpaiguri. Overnight onboard the train. Arrive New Jaipalguri around 0800hrs. Upon reaching New Jaipalguri, drive on by road to Darjeeling (90 km from NJP Railway Station). Check-in at the hotel. Evening at leisure to explore the hill town. Overnight at hotel. Wake-up early in the morning and reach Tiger Hill to enjoy the magnificent view of sunrise on the Mt. Kanchanzonga. Stop midway to visit the Batasia Loop and Ghoom Monastery. Back to the hotel for breakfast then start a sightseeing tour covering the Himalayan Mountaineering Institute, the Zoological Gardens, the Tibetan Refugee Self Help Centre and a visit to a tea estate. 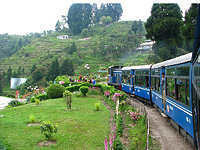 Later, transfer to Darjeeling Himalayan Railway, affectionately known as the ‘Toy Train’ for a Joy Ride to Ghoom, surely the most romantic way to approach the majestic and mysterious Himalayas. In the evening, take a guided walk through the Mall area, full of food stalls, markets and shops. Afterward, head back to your hotel for dinner and overnight. After an early breakfast, drive 130km to Pelling. The journey affords opportunities to stop and admire magnificent scenery, including misty pine forests, tea gardens, river valleys, waterfalls, and of course the snow capped mountains of Khangchendzonga. 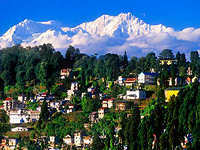 The pleasant little town of Pelling is the base from where trekkers set out for treks into West Sikkim. This morning visit two of Sikkim’s most revered monasteries. The oldest, Sangachoeling Monastery, was founded around 1697 (walk approx 40 mins). The second oldest, the awe-inspiring Pemayangtse (‘Perfect Sublime Lotus’) Monastery, founded in 1705, houses a good collection of wall paintings and sculptures. Also visit the Rabdentse Ruins. Drive 52km from Pelling to Yuksom, the first capital of Sikkim en-route the sacred Khecheopalri Lake, upon which leaf lamps are floated during evening prayers. Situated at an altitude of 1780m, it is the starting point for mountaineering expeditions and treks to higher Khangchendzonga ranges. You may like to visit the Dhubdi Monastery, located on a hilltop about an hour’s trek from Yuksom. Built in the 17th century, its name means ‘the retreat’. 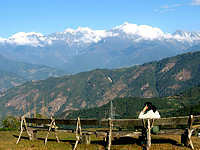 Ravangla is popular for its breathtaking views of the Himalayas and for its tranquility. You may like to simply relax and enjoy the scenery here, or you may prefer to trek through the surrounding forests of oak, pine, chestnut, magnolia and rhododendron trees. This morning drive 65 km to Gangtok – stopping off on the way to visit Singtam and its major attraction, the Bermoik Monastery. Gangtok, the capital of Sikkim, is known for its extravagant scenic beauty and is famous for its monasteries. Check into your hotel with free time in the afternoon to explore the fascinating bazaar on MG Road. Rise early to view sunrise over the Kanchenjunga range from Tashi View Point. 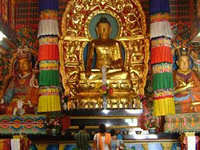 After breakfast take in the sights around Gangtok, including Ganesh Tok, Hanuman Tok, and the Institute of Tibetology. 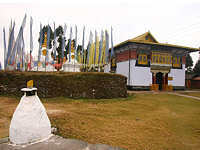 Later visit the serene monastery at Rumtek. The contrast between the bustle of busy Gangtok and the quiet of the monasteries and gompas at Rumtek, is striking. 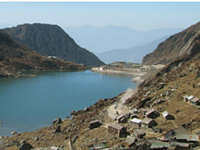 An excursion today to Tsomgo Lake, set in an area of spectacular scenic beauty. This is the closest point that westerners can access to the Tibetan border, some 20km further on. While there you can walk or ride a yak around the lake (direct Payment). Yaks may not be the most comfortable animals to ride but this is an unmissable opportunity! Leaving Sikkim, make the 85 km journey to Kalimpong, known for its horticulture (particularly its wide array of orchids and gladioli) and spectacular views. In the afternoon take in some of the highlights of this picturesque town including the Dello Hills, Dr Graham’s Childrens’ Home, a small factory making paper by traditional methods, and flower nurseries. Today drive to Gurumara National Park. Located in the Terai region of the Himalayan foothills, this medium-sized wildlife sanctuary of grasslands and forests is primarily known for its population of Indian Rhinoceros. The best way to view wildlife is from the numerous well-located watchtowers. 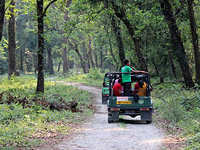 Afternoon enjoy Jeep Safari at Gorumara National Park- Overnight at Chalsa/Gorumara. After breakfast, drive to Bagdogra airport (80kms) to board your flight to Kolkata, departs at 1510hrs and arrives Kolkata at 1610hrs. On arrival, transfer to your hotel where a day-use room is available for your comfort. The remains of the day is at leisure followed by evening transfer to airport.